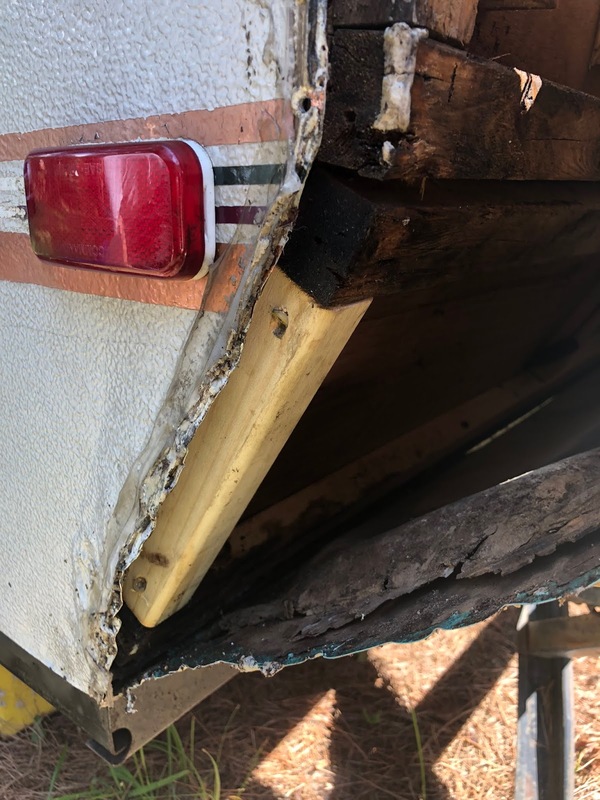 As an RV owner, the fear of rotted wood is real. 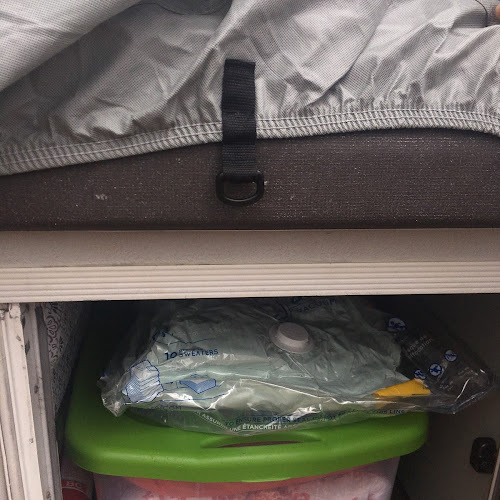 Owning an older and camper, that fear has increased. 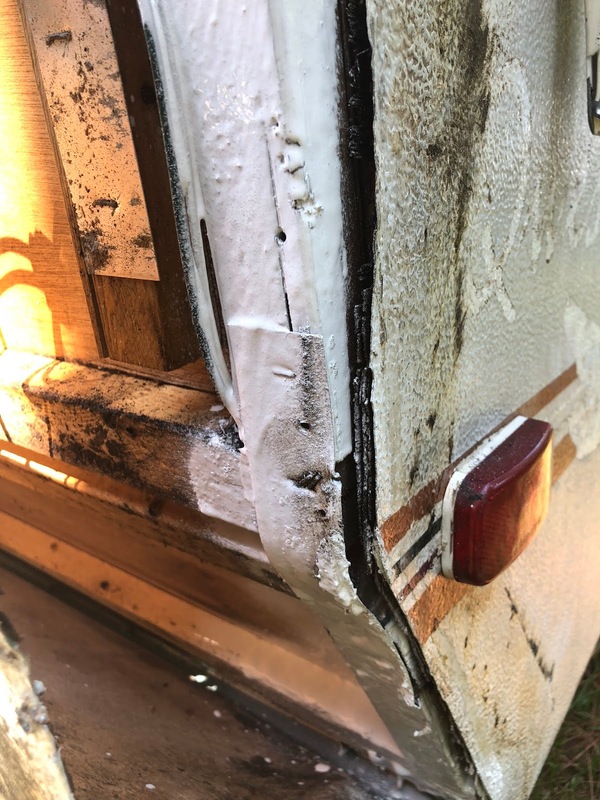 But even if you find that your camper has damage, these problems can be repaired. 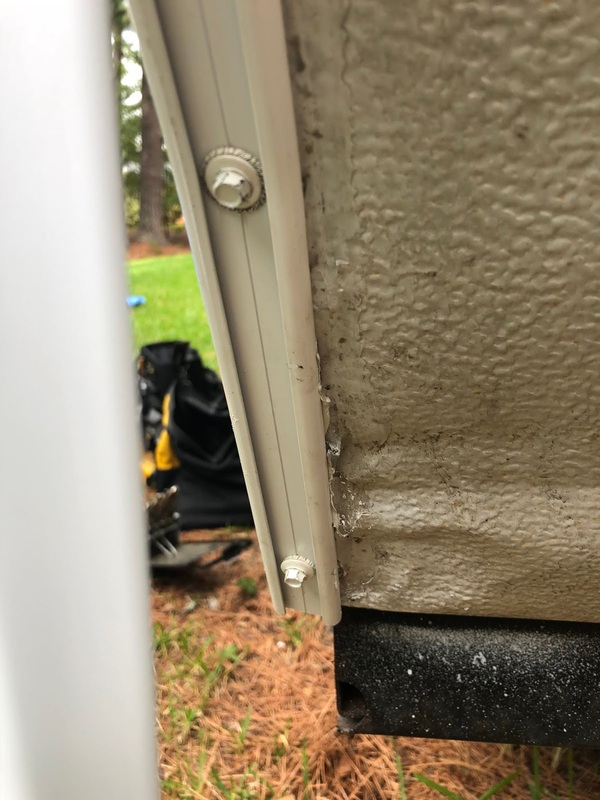 Shortly after purchasing our camper, I noticed a side seam coming undone in one place. If you notice an issue like this, a simple seam repair is probably not going to fix your problem as I assumed. Don't panic. I originally fixed this with a piece of Eternabond, but I knew that this was not a permanent repair. 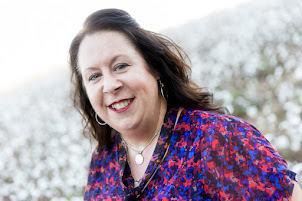 Below is Peggy Sue before. I have tried to keep this out of photo opts until this point! Now that I have repaired the side seam. We can finally paint and apply the new decals. Then you will see the final reveal! The Eternabond left a terrible place that I've been working to remove where the adhesive was. I had called Derek at Coleman Pop Up Parts. 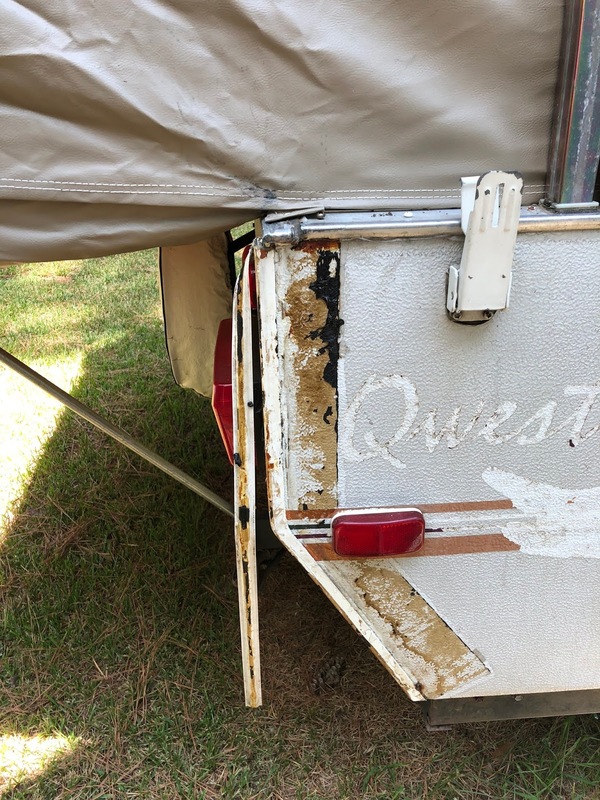 Even though they are a Coleman dealer, he was able to get me the Jayco part that I needed to repair our side seam. 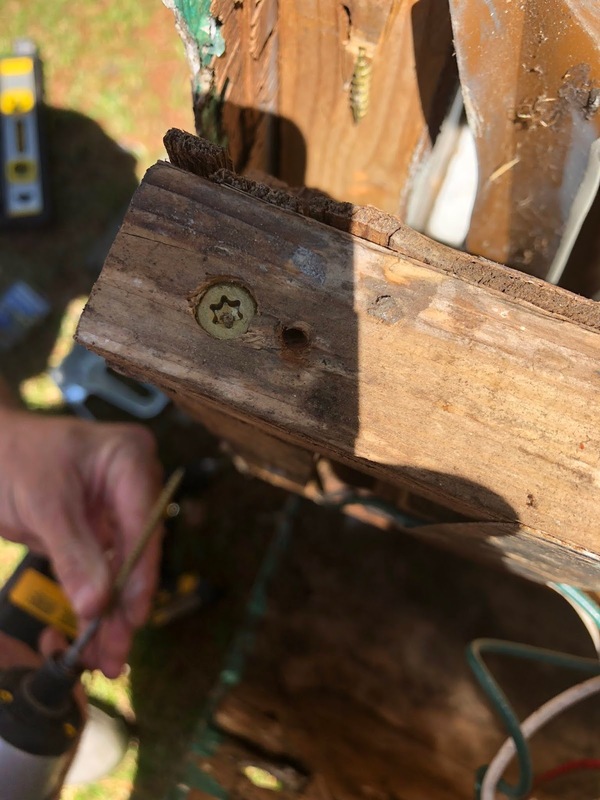 When I tried to install this part, I realized that wood rot beneath our skin was prohibiting the nails from having anything to screw into. I was devastated. My husband went into panic mode. Tools and big jobs like this are not his deal. I immediately when into fix it mode. I called a friend from work that has saws and big tools and made a date to get the job done. 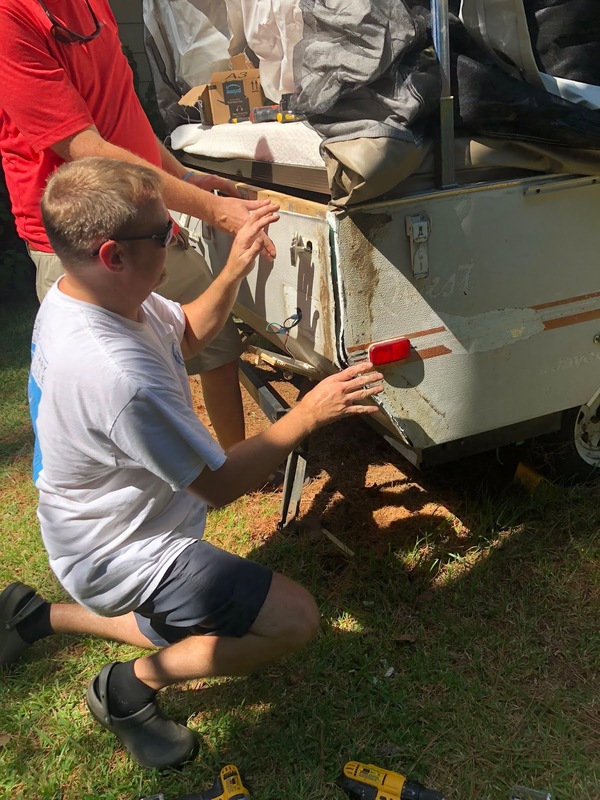 We were working on the back end of our pop up camper where the spare tire is located. 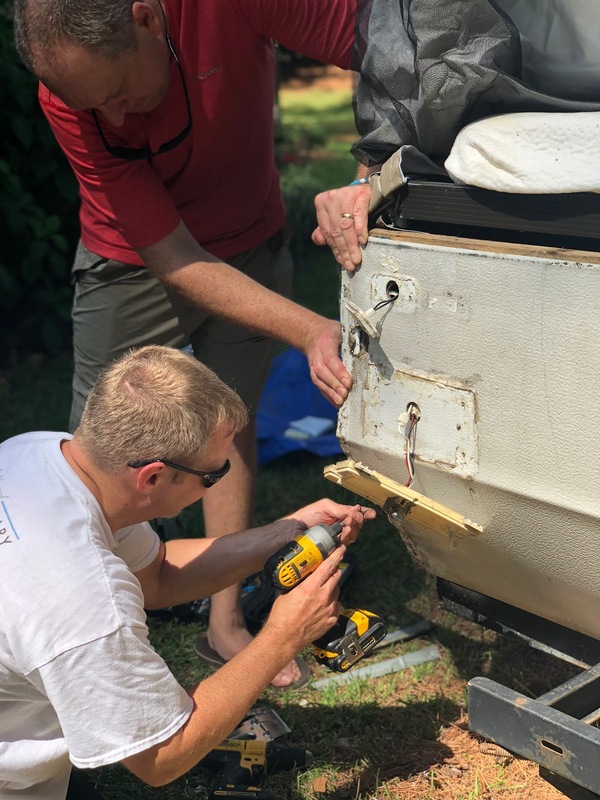 Begin by removing the spare tire and cranking up the pop-up camper. 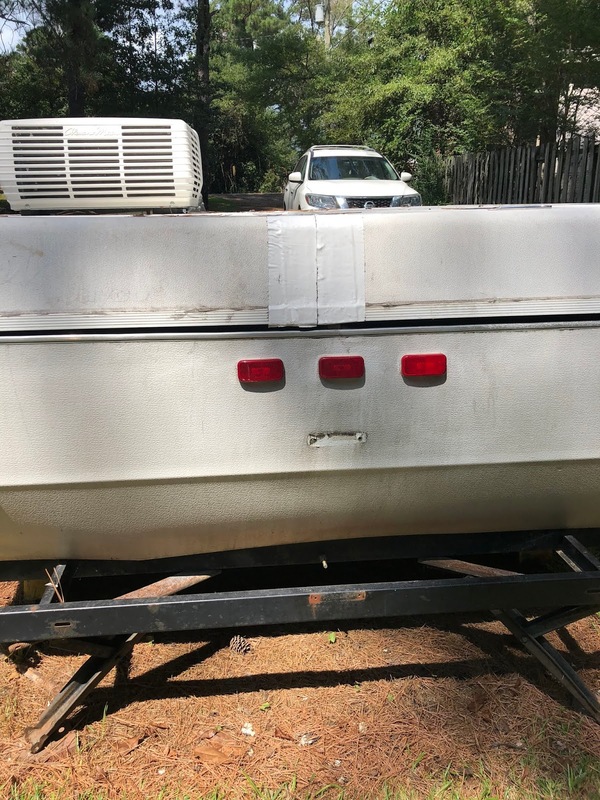 You will also need to remove the brake lights and metal bar that fits under where the bunk end extends. Next, remove the side seams. If you are concerned about putting everything back after you are done, put all of your screws into a box to keep up with. Also, take photos as you work to show each step of the deconstruction. There will be a series of staples after you remove your pieces. Start to pull these back as well. This will expose what is beneath the skin. What we discovered were a million ANTS! My skin is still crawling from this! And much less wood rot. Ants love both Mississippi and water. Rotting wood is their calling card. 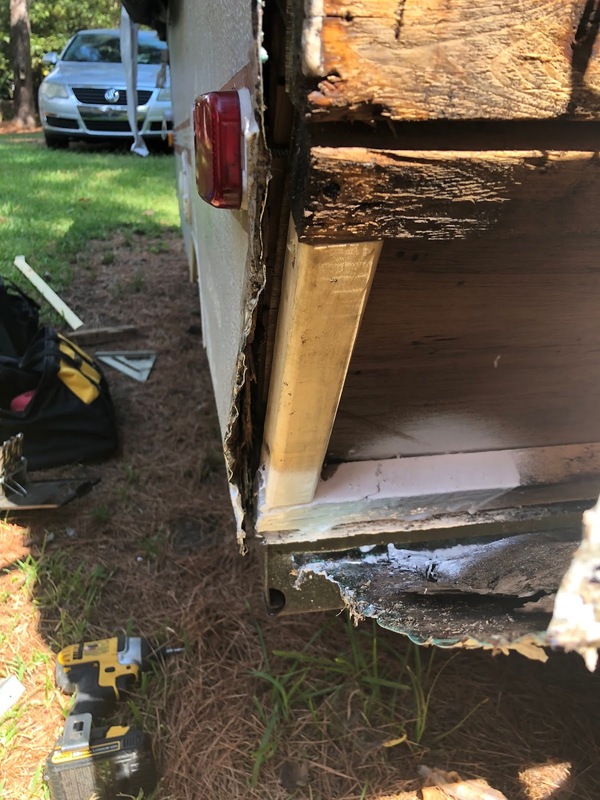 There was one corner that was really the worst, so we were able to determine one small piece needed to be replaced, but the rest of the wood was really okay. We sprayed for ants and used a blower to remove any debris and dead ants before starting. We made a plan of what supplies we needed and how to attack the damage. Ryan determined that we could replace the one piece of wood. But, he also wanted to reinforce the back wall with some long wood screws. 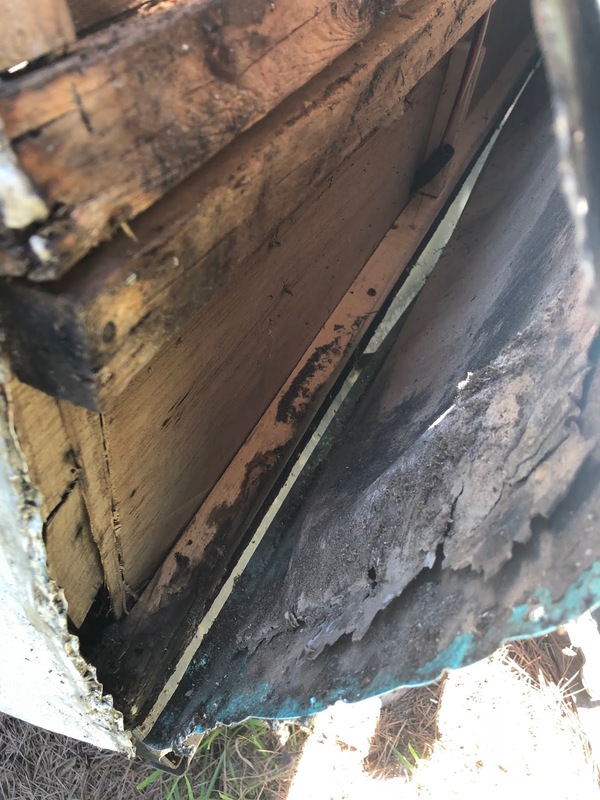 Additionally, he suggested that we use Flex Seal to treat any of the wood along the edges that were not rotting but may have gotten wet. This would seal the wood and keep it from getting any worse. Finally, I had some 303 Mold and Mildew cleaner and treatment that I would spray along the wood to keep it from growing any possible mold. 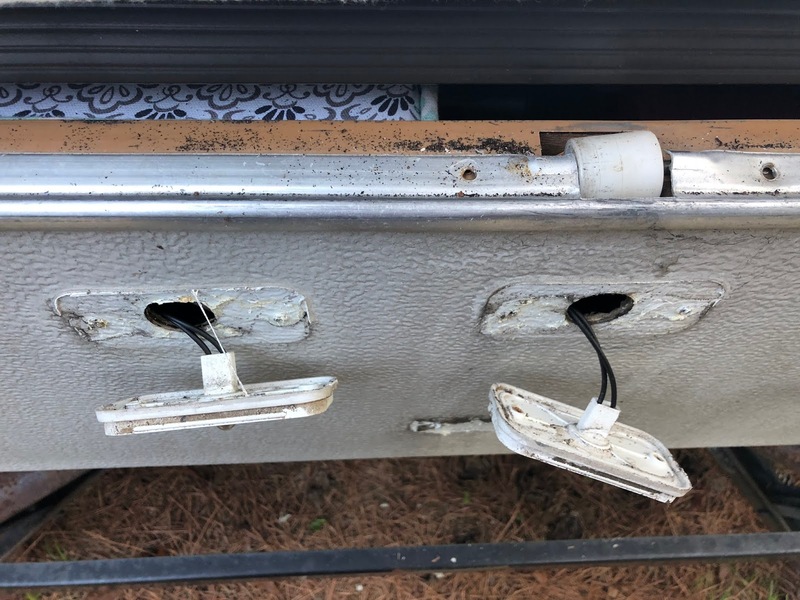 We would complete our work by replacing the side seams, returning the brake lights and putting everything else back into place. 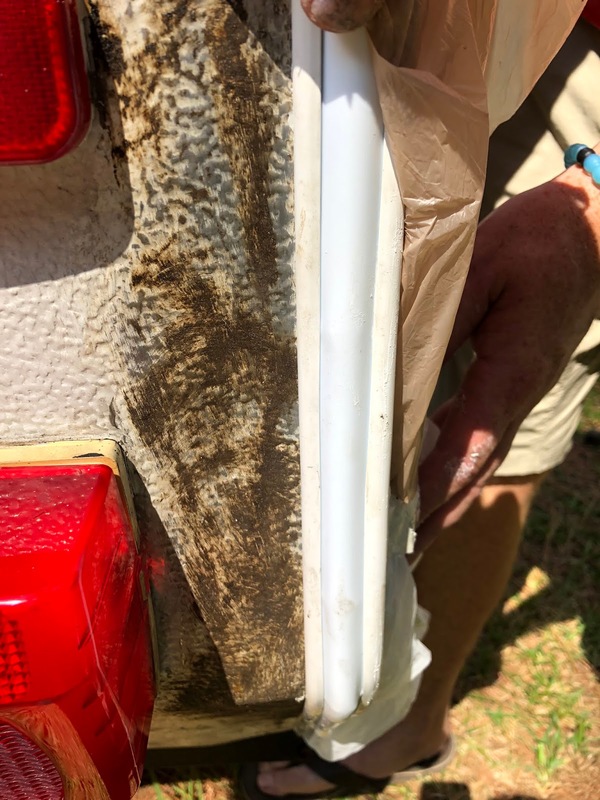 The last step would be to reapply caulk around the seams and lights. And this plan worked like a charm! I was amazed at the results. While this looks really dark, it's not really as bad as it seems. The cardboard-like wood against the skin was damaged. We cleaned this up and kept going. 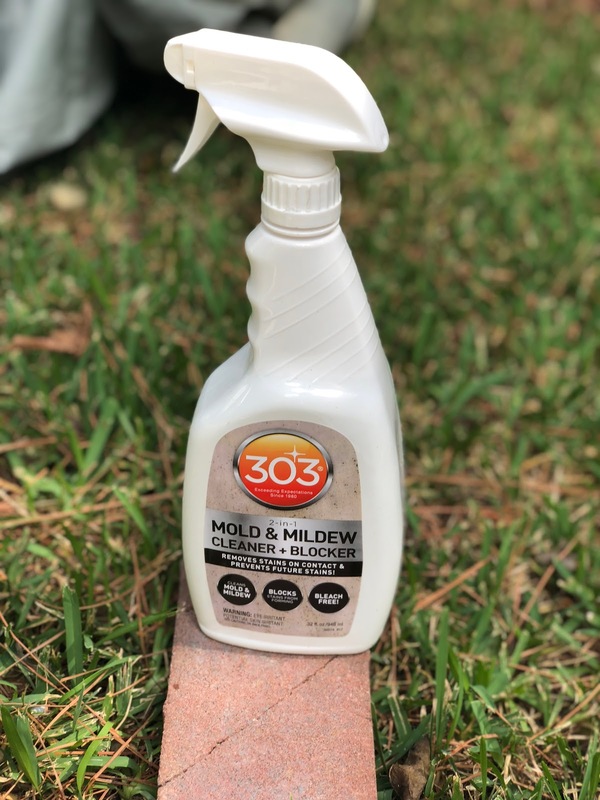 I treated the wood inside with this 303 Mold and Mildew Cleaner and Blocker. The Flex Seal went on along the edges to protect the wood. We sprayed a nice amount along the edges coating it really well as we went. The new deck railing that was cut to replace the rotted wood! Ryan reinforced the back panels with long wood screws along the top and the sides. Then we started to re-staple the skin back into place before adding the seams. Checking to make sure that everything would fit. The new side seams with hardware in place. Put some butyl putty behind the pieces before adding them for a good seal. Add your vinyl insert to cover the screws. Don't mind that last photo. That is some old adhesive that we removed. It has left a film that I'm removing to paint. I had held the side seam in place before this with Eternabond. Just an FYI, this will NOT fix your problem. 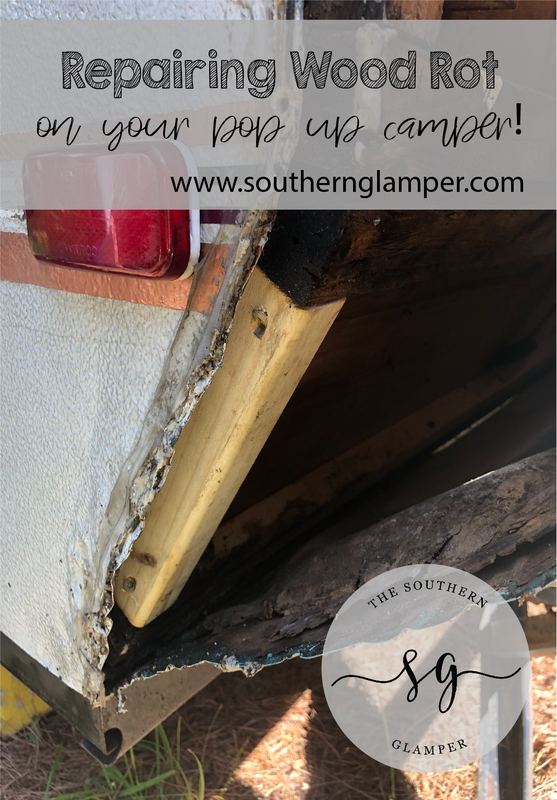 It was a temporary fix for the time being, but not we have a permanent repair for our camper. Be organized and take your time. Work to identify your needed supplies. 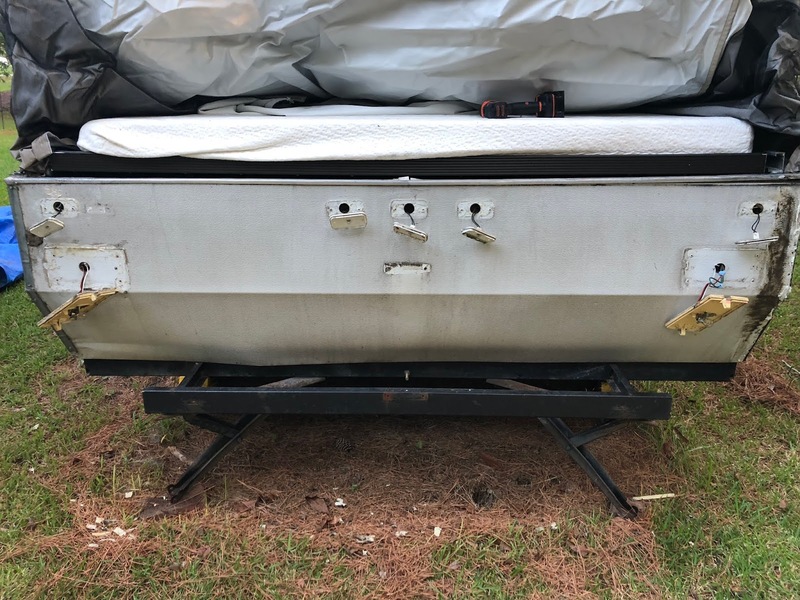 You can most likely not anticipate all of this until you start taking your camper apart. 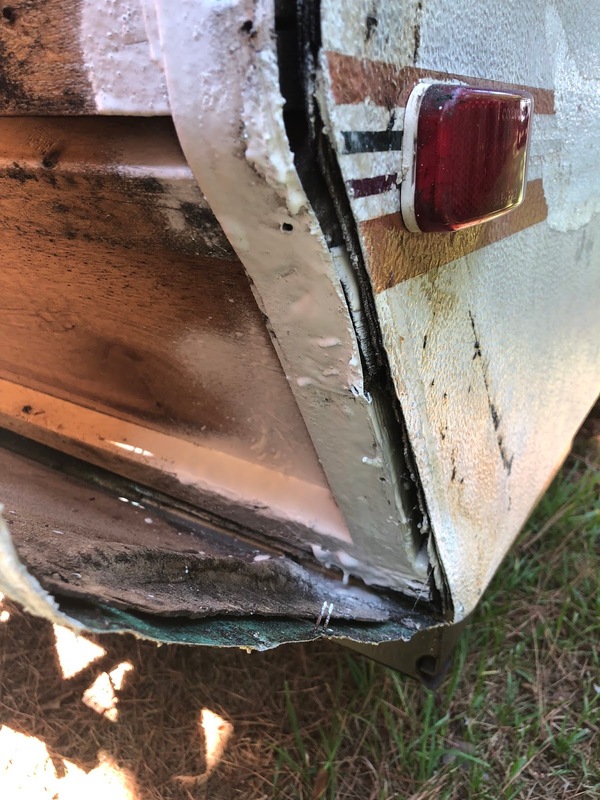 Keep your butyl tape in the freezer until you are ready to use it. It makes it much easier to work with. I highly recommend using the JR Products brand of the vinyl insert. 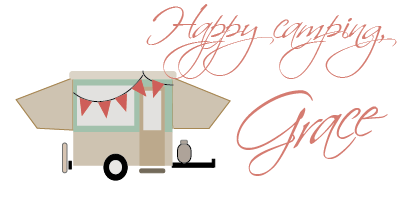 It costs more than other competitors, but it gets the best reviews. 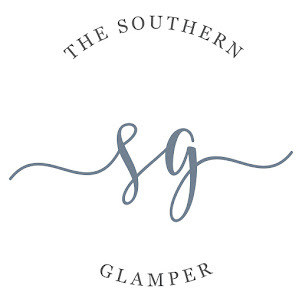 I have used this brand of products for several projects with great results. If you are doing this yourself, allow yourself to be creative in some areas to get the best results. 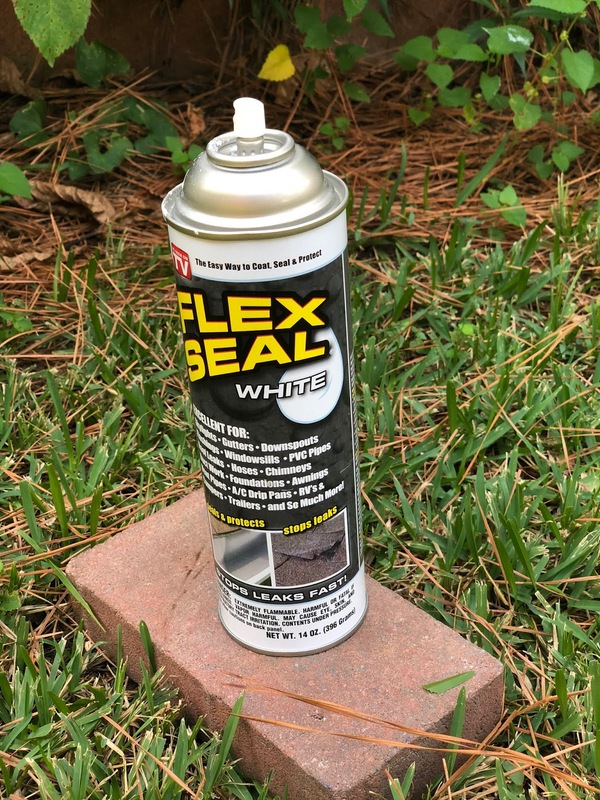 Ryan's suggestion for the Flex Seal on the wood was an excellent suggestion. It was practical, and I feel good about it. More hands make for light work. The three of us did this in a couple of hours. 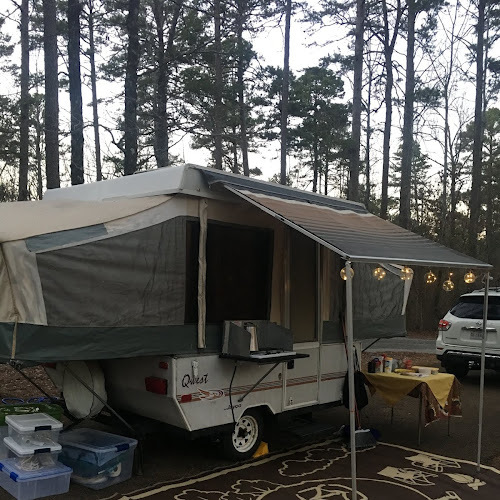 The sheer size of a pop-up camper limits the amount of time and space of the project like this alone. 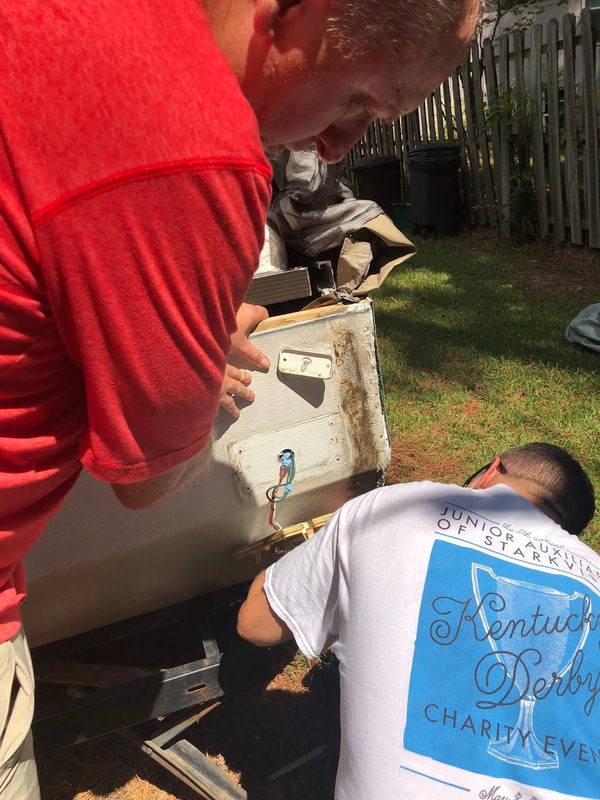 You can make these repairs, but you will need the right people to help you do this project. 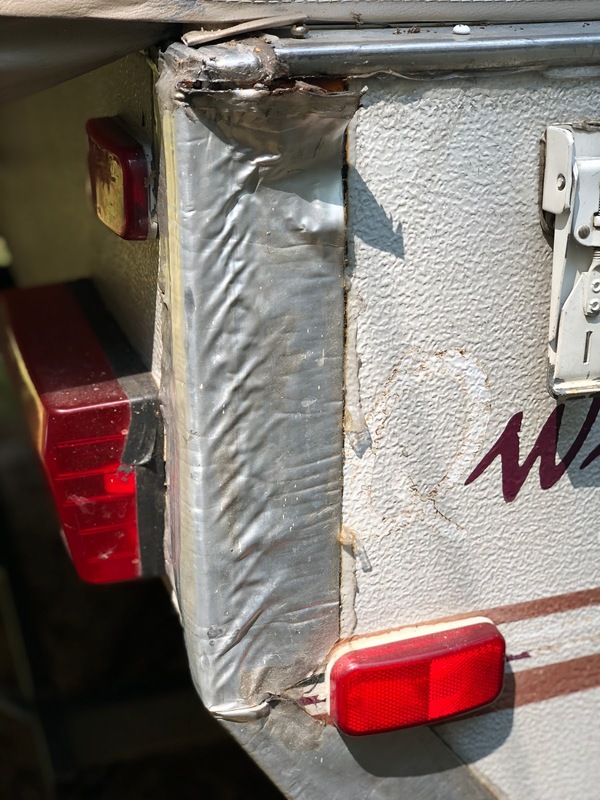 Have you tackled a big repair on your RV? This was probably the biggest and scariest thing that we have tackled. We had no idea what we were getting into and were hoping for the best. And it worked out well. I'd love to hear your thoughts. Feel free to ask any questions you have. I'll be sharing our new paint job and new decals very soon. I cannot wait. We are now on a timeline to get this done before our mid-October trip. 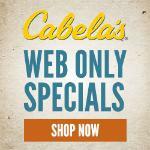 Be sure to share this post on Pinterest. Sew a Weekend Skirt in Less Than an Hour!